On May 12th I had a fisherman's dream day. A quick preface to this story is that this Spring I got serious about fishing. I was the guy that loved to fish but didn’t know the right way to rig a worm and always wondered why others had better luck. Well, I started reading a lot about bass fishing and really started the year off with much better luck practicing what I learned from my research. OK, back to the story. I met a friend at a pond at daybreak and fished topwater lures. 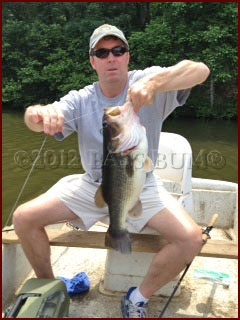 I caught a 4.5 lb largemouth on a Pop R and then my buddy pulled in a 5+ pounder soon afterwards. Great start but it gets better. I went home and stretched out on the sofa then the phone rings. Another friend is on the line and he tells me that my daughters are coming out to his father-in-law's country place and asked did I want to bring them and fish if the opportunity presented itself. I accepted and, thanks to his wife, Will and I got loose on a very nice lake that is known to have big largemouth bass in it. Well, right out of the boathouse Will catches one along the bank, while I'm wrestling a backlash. Then, I throw my Zoom 8" pumpkin seed Texas rigged lizard toward the bank and begin to walk him when I feel a sizable thump. I reel and then pull to set the hook. I'm puzzled and disappointed with my lack of strength because I don't get the rod back like normal. Well, I soon realized why. I had a heifer and a fight on and I watched in amazement as it surfaced and Will slid the net under it. Will declares,"What a Pig!" and I cracked up. It weighed 7.75lbs, my biggest ever! He proceeded to out fish me the rest of the day but this photo shows how in shock I was, and continued to be, the rest of one of the best bass fishing days I’ll ever experience.